Healthier Corn Fritters. So a few weeks ago, our co-op offered an add on of 48 ears of organic and non GMO corn. I love corn on the cob, so I got the add on. That day, we boiled and cut all the corn and stuck most of it in the freezer. It took all day! I used some to make my Honey Balsamic Bean Salad. This weekend, we decided to make corn fritters. The traditional way calls for deep frying. We pan seared ours and then baked them. So they still have a crunchy crust, but are mostly baked. This is one of my husband’s recipes. These came out so good! It’s been rainy here the last couple days and I didn’t want to eat them before I was able to get photos. I am so glad I got a chance to shoot these so I can have them for lunch today. These fritters would be perfect on top of a salad, eaten as a burger, or just topped with some avocado. Throw all the ingredients in a bowl , and mix until the batter comes together. I did this by hand. Form into small patties. I used a 1/4 cup measurement for this. Lightly oil a large saucepan on medium to medium high heat. Lay the patties into the pan and sear for 1-2 minutes on each side. Just enough to give it a nice crispy outside. You may need to add a bit more oil if the pan looks dry. Repeat these steps until all the patties are seared. Lay the patties on a parchment lined baking sheet. Bake for 20 minutes, stopping in the middle to flip them over. Enjoy! I got 10-12 patties out of this batch. Hey! These fritters look really good. I can't eat gluten. Is there something I can use to substitute the flour? Thank you. Sure! You can probably sub gluten free flour, but add an egg to help with the binding. Awesome! I loved that salad too! These fritters went fast in our house. 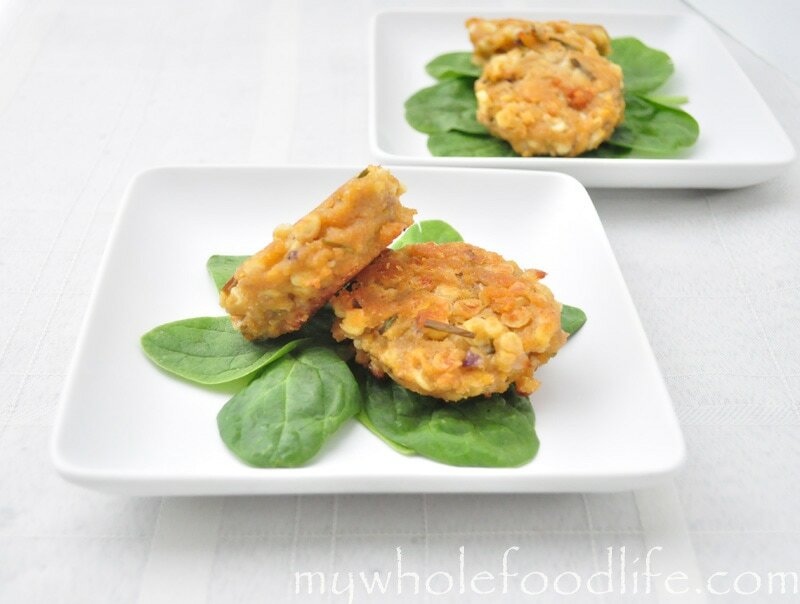 How nice to see a recipe for a healthy corn fritter! I'm curious to know what role the nutritional yeast plays in the recipe - it's an ingredient that I have never kept in my pantry, and would have no other use for. My husband added it in since he loves it. You can totally omit it and I think these would taste just as good. Nutritional yeast has a nutty and cheesy flavor. We add it to our veggie burgers and that is probably why he added it in these. Yay for hubbies with great ideas! (Sometimes my guy totally surprises me with some creative recipe I never would have dreamed up myself!) These look fantastic - so simple, so healthy! Like you, I adore corn on the cob, and I've been making all sorts of different corn recipes this month. Guess I need to add this to the must-try list! Thanks, Melissa! You are so welcome Shelley! I hope you enjoy them. These were so good! Both my husband and I loved them! A side note on the nutritional yeast for Susan; we like it too plus it adds fiber and protein to food-2 things important to all diets! It is also salt free, sugar free and gluten free. More benefits! Try it on popcorn instead of salt and butter! Anyways can't wait to serve these to my southern friends, HA! My goodness they deep fry everything and it gags me! These taste so much better than anything saturated and fried in unhealthy oils! Thanks again for all your recipes and encouraging words, posts-love your site! Yay! I'm so glad you liked them! I love putting nutritional yeast on kale chips too! Oh that sounds tasty-just bought some organic kale yesterday to make into chips today-thanks-I'll give it a try.